Pre-industrial anthropogenic CO2 emissions: How large? Fifteen years after publication of Ruddiman (2003), the early anthropogenic hypothesis is still debated, with relevant evidence from many disciplines continuing to emerge. Recent findings summarized here lend support to the claim that greenhouse-gas emissions from early agriculture (before 1850) were large enough to alter atmospheric composition and global climate substantially. Marine isotopic stage (MIS) 19 is the closest orbital analog to the current MIS 1 interglaciation (Tzedakis et al., 2012), with similarly small changes in precession (εsinω) and nearly synchronous peaks in sin and obliquity (Fig. 1a, b). MIS 11 was once claimed to be the closest MIS 1 analog (for example, Broecker and Stocker, 2006), but that claim is now rejected because obliquity and precession peaks in MIS 11 were far offset. Figure 1 Comparison of (a) obliquity and (b) precession (εsinω) trends during MIS19, (green), MIS11 (black) and MIS1 (red). Based on Tzedakis et al. (2012). (c) CO2 trends during MIS19 (black) and MIS1 (red). CO2 data for MIS 19 are from Dome C (Bereiter et al. 2015). CO2 data for MIS 1 are from Law Dome (MacFarling Meure et al. 2006) and Dome C (Monnin et al. 2001, 2004) for MIS1. With MIS 11 eliminated as an analog, the focus is on MIS 19. The CO2 signals early in MIS 1 and MIS 19 (Fig. 1c) reached nearly identical peaks of 270 and 269 ppm, after which the MIS 1 value fell for 4000 years but then rose by 20 ppm to a late pre-industrial 280-285 ppm. In contrast, the MIS 19 CO2 trend continued downward for more than 10,000 years to 245-250 ppm by the time equivalent to the present day. This value is consistent with the 240-245 ppm level proposed in the early anthropogenic hypothesis for a natural Holocene world (with no human overprint). The 35-ppm difference between the two interglaciations is close to the 40-ppm Holocene anomaly inferred by Ruddiman (2003). A GCM simulation of the MIS 19 time equivalent to today by Vavrus et al. (2018) indicates that the low CO2 values would have caused year-round snow cover (indicative of incipient glaciation) in the Canadian Archipelago and over Baffin Island (an area roughly the size of Greenland), as well as other Arctic regions (see also Ganopolski et al., 2014). Ruddiman (2003) estimated pre-industrial carbon emissions of 300-320 Gt, based on a back-of-the-envelope compilation of the incomplete forest clearance histories then available (Table 1). [One Gt is one billion tons]. That estimate was for a while rejected as too high by a factor of 5 to 10 (Joos et al., 2004; Pongratz et al., 2008; Stocker et al., 2011. However, Kaplan et al. (2011) found that those estimates had been biased downward because they assumed much smaller early per-capita clearance than the large amounts shown by actual historical data. Those estimates also ignored areas that had been cleared and were not in active agricultural use, but had not yet reforested. Adjusting for these factors, Kaplan and colleagues estimated pre-industrial emissions of 343 GtC. Erb et al. (2017) averaged 7 estimates of the amount of carbon that would currently be stored in Earth’s potential natural vegetation had there been no human activities (910 GtC) compared to the 460 GtC carbon actually stored there today. They attributed the difference of 450 GtC to cumulative vegetation removal by humans (mostly deforestation). With ~140 GtC of clearance having occurred during the industrial era, that left an estimated 310 GtC as the total removed and emitted to the atmosphere during pre-industrial time. In a similar analysis, Lorenz and Lal (2018) estimated pre-industrial carbon emissions of ‘up to’ 357 GtC. Studies in other disciplines have begun adding direct ground-truth evidence about early clearance. Analyses of pollen in hundreds of European lake cores (Fyfe et al., 2014; Roberts et al, 2018) show that forest vegetation began to decrease after 6000 years ago and reached near-modern levels before the start of the industrial era (Fig. 2). In China, compilations of over 50,000 archaeological sites by Li et al. (2009) and Hosner et al. (2016) show major increases of farming settlements in previously forested areas beginning 7,000 years ago. These extensive compilations support the above estimates of large early anthropogenic clearance and C emissions. Figure 2. Evidence of early forest clearance in Europe. (A) Locations of cores in the European pollen database. Cores used for pollen summary in B are shown in red (Fyfe et al., 2015). (B) Changes in forest, open, and semi-open (mixed forest and open) vegetation plotted as ‘pseudobiome’ sums. As this wide-ranging multi-disciplinary evidence has emerged, some scientists continue to reject the early anthropogenic hypothesis. Most of the opposition is based on a geochemical index (δ13CO2) measured in CO2 contained in air bubbles trapped in ice cores. The δ13CO2 index shows the relative balance through time between the amount of 12C-rich terrestrial carbon from the land and 13C-neutral carbon from the ocean. The small 13C decrease in atmospheric CO2 during the last 7000 years has been interpreted as indicating minimal input of 12C-rich terrestrial carbon during that time (Broecker and Stocker, 2006; Elsig et al., 2009). In a July 20, 2018 Scienceonline.org post, Jeff Severinghaus estimated the early human contribution to the observed CO2 rise as “1 to 2 ppm at the most”, or just 5-10% of the recent estimates reviewed in Table 1. Other scientists (Stocker et al., 2018; Ruddiman et al., 2016) have pointed out that the δ13CO2 index cannot be used to isolate the amount of deforestation carbon unless all significant carbon sources and sinks are well constrained. The compilation by Yu (2011) indicating that ~300 Gt of terrestrial (12C-rich) carbon were buried in boreal peats during the last 7000 years shows that this constraint had not been satisfied in previous studies. Burial of ~300 GtC in boreal peats requires a counter-balancing emission of more than 300 GtC of terrestrial carbon during the last 7000 years, and the discussion above summarizes evidence that pre-industrial deforestation can fill that deficit. Even now, however, carbon exchanges (whether sources or sinks) in non-peat permafrost areas and in river floodplains and deltas during the last 7000 years remain poorly known. Scientists trying to make up their minds about this still-ongoing debate can now weigh wide-ranging multi-disciplinary evidence for large early forest clearance against reliance on the as-yet poorly constrained δ13CO2 index. Bereiter, B., S. Eggleston, J. Schmitt, C. Nehrbass-Ahles, T. F. Stocker, et al. (2015), Revision of the EPICA Dome C CO2 record from 800 to 600 kyr before present, Geophys. Res. Lett., 42, 542–549. Broecker, W. S. and T. L. Stocker (2006), The Holocene CO2 rise: Anthropogenic or natural? EOS Trans. Amer. Geophysical Union 87, 27. Erb, K.-H., T. Kastner, C. Plutzar, C., A. L. S Bais, N. Carvalhai., et al. (2018), Unexpectedly large impact of forest management on global vegetation biomass. Nature 553, 73-76. Elsig J., J. Schmitt, D. Leuenberger, R. Schneider, M. Eyer, et al. (2009), Stable isotope constraints on Holocene carbon cycle changes from an Antarctic ice core. Nature 461, 507-510. 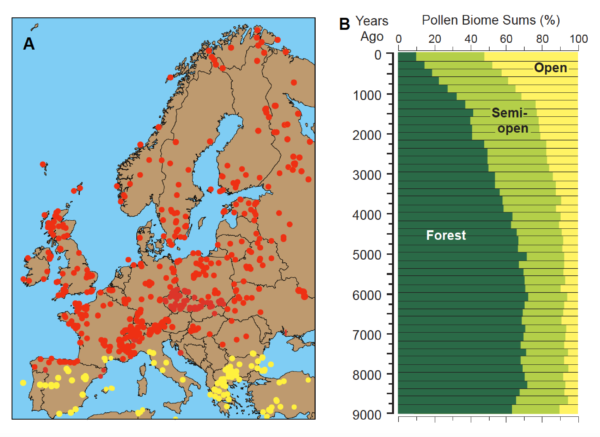 Fyfe, R. M., J. Woodbridge, and N. Roberts (2015), From forest to farmland: pollen-inferred land cover changes across Europe using the pseudobiomization approach. Global Change Biology 20, 1197-1212. Ganopolski, A., R. Winkelmann and H. J. Schellenhuber, (2014), Critical insolation-CO2 relation for diagnosing past and future glacial inception. Nature 529, 200-203. Hosner, D., M. Wagner, P. E. Tarasov, X. Chen, and C. Leipe (2016), Spatiotemporal distribution patterns of archaeological sites in China during the Neolithic and Bronze Age: An overview. The Holocene 26, 1576-1583. Joos F, Gerber S, Prentice IC, et al. (2004) Transient simulations of Holocene atmospheric carbon dioxide and terrestrial carbon since the last glacial maximum. Global Biogeochemical Cycles 18. DOI: 10.1029/2003GB002156. Kaplan J. O, K. M. Krumhardt, E. C. Ellis, W. F. Ruddiman, C. Lemmen, et al. Goldewijk (2011), Holocene carbon emissions as a result of anthropogenic land cover change. The Holocene 21, 775-792. Li, X., J. Dodson, J. Zhou, and X. Zhou (2008), Increases of population and expansion of rice agriculture in Asia, and anthropogenic methane emissions since 5000 BP. Quat. Int. 202, 41-50. 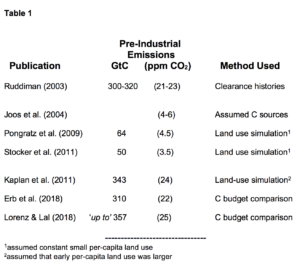 Lorenz, K. and R. Lal (2018), Agricultural land use and the global carbon cycle. In: Carbon sequestration in agricultural systems, p. 1-37. MacFarling Meure, C., D. Etheridge, C. Trudinger, P. Steele, R. Langenfelds, et al. (2006), Law Dome CO2, CH4 and N2O ice core records extended to 2000 years BP. Geophys. Res. Lett., 33, L14810, doi:10.1029/2006GL026152. Monnin E., A. Indermühle, A. Dällenbach, J. Flückinger, B. Stauffer, et al. (2001), Atmospheric CO¬¬2 concentrations over the Last Glacial Termination. Science, 291, 112-114. Pongratz, J., C. Reick, T. Raddatz, and M. A. Claussen (2008), A reconstruction of global agricultural areas and land cover for the last millennium. Global Geochemical Cycles 22, GB3018m doi:10.1029/2008GLO36394. Ruddiman, W. F. (2003), The anthropogenic greenhouse era began thousands of years ago. Climatic Change 61, 261-293. Ruddiman, W. F., D. Q. Fuller, J. E Kutzbach, P. C. Tzedakis, J. O. Kaplan et al. (2016), Late Holocene climate: Natural or anthropogenic? Rev. of Geophys. 54, 93-118. 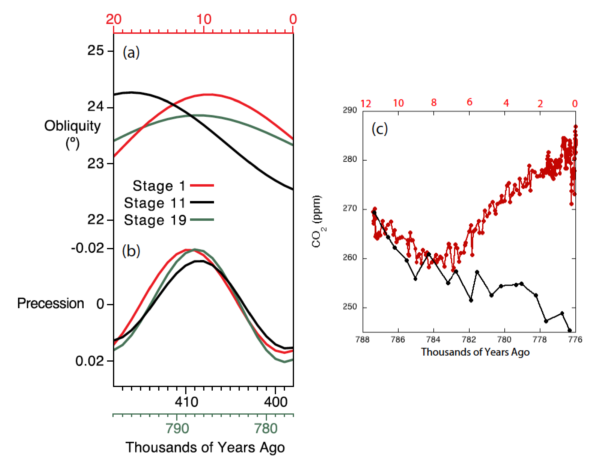 Stocker, B. D., K. Strassmann, and F. Joos (2011), Sensitivity of Holocene atmospheric CO2 and the modern carbon budget to early human land use: analyses with a process-base model. Biogeosciences 8, 69-88. Stocker, B.D., Z. Yu, and F. Joos (2018), Constraining CO2 emissions from different Holocene land-use histories: does the carbon budget add up? PAGES 26, 6-7. Tzedakis, P. C., J. E. T. Channell, D. A. Hodell, H. F. Kleiven, and L. K. Skinner (2012), Determining the length of the current interglacial. Nature Geoscience 5, 138-141.
natural Holocene. Nature Scientific Reports 81, doi:10.1038/s41598-018-28419-5. Does it make a big difference whether the baseline is 250 versus 278 ppm? Indigenous populations routinely set fire to portions of their environment, going back most likely tens of thousands of years. This is true not only of primitive agriculturalists (slash and burn) but hunter-gatherers as well, who would often use fire to flush out game. It is now thought that much of the “pristine” American landscape was formed by the continual setting of forest and grass fires by native Americans for a variety of reasons. Thank you, Prof. Ruddiman for this article. Is there research in progress that could tighten limits on the C13 question ? Recient evidence of a reduction of the AMOC which appears to preced the modern industrial era has in some quarters been taken as evidence of long term natural variability in the AMOC, as an anthropogenic influence was assumed unlikely. As a result the slow but accelerting decline in the AMOC has perhaps been misinterpreted as partlty natural. The alternative is that the AMOC is in fact highly sensitive to anthropgenic warming, much more so than the majority of current models predict. So “precession” is actually the eccentricity of the Earth’s orbit e (not epsilon, which is the obliquity) multiplied by the direction cosine between the Earth’s axis tilt and the line of apsides, omega being the ecliptical longitude of the perihelion? So, the tendency of Earth being closest to the Sun in summer. I heard about your book, “Earth Transformed,” here on this web site and then immediately purchased it. I acted quickly because I hadn’t encountered the idea before and it intrigued me when I read the overview. I personally enjoy reading about ideas that even if they may yet turn out wrong in the end. They push my imagination and might even add another way to think about the world around me. And the idea promised much in that regard. So of course I bought it! After reading it I think that the hypothesis was thoughtful and very, very enjoyable to consider. I also think it deserves an increasing share of the tiny research pie and I hope funding for further research continues and improves over time until it is either dispelled or else incorporated as a standard part of the main body of work. Separately, just as a matter of how well the book communicated to me, I truly enjoyed every moment. It was so readable, interesting, and well-fashioned that I just found myself shooting through it almost without stop. It was that good. I can only imagine how much was distilled into producing it, but it certainly shows. It’s downright beautiful! Not at all dry, but almost to a page very, very interesting. It made me think. And I loved it for that. Note: I recognize that not all well-presented ideas will pan out. In fact, most of the hard work in science isn’t recognized and doesn’t make the news likely to reach lay people like me. A friend of mine was doing a research project related to observed ultraviolet patterns found on spiders, with the question she asked (from my very lay perspective) being something like, “Do spiders also see these patterns and are they related perhaps to mating behaviors?” Turns out, after three hard years of work, that her answer is, “No. They don’t.” This gets published, of course, in a 6th tier publication in terms of “impact.” And she just spent three hard years of her life helping others either avoid a dead-end or else better shape the next question to ask, anyway. And that is all that this portion of her time and her life will have ever meant! But I was still made to think about a new question while she was working on it, too. And I enjoy being exposed to ideas, even if they turn out “wrong” in some sense. While I’m on books that I’ve learned from and enjoyed that I also heard out here on this site, there is Paul N. Edwards’ “A Vast Machine: Computer Models, Climate Data, and the Politics of Global Warming.” I don’t recall much about the “politics” side included in the title. Instead, I remember it as a very readable and very educational (for me) book that helped me appreciate the history, work, and (most importantly to me) the contexts behind, the meaning of, and use of the process of renormalization. I had vague and far more conflated (muddied) ideas about it, before reading this book. I have a much, much better appreciation for, respect for, and appreciation for the use of such processes as a part of the climate science endeavor now. And I can’t imagine how an educational path for me might have been much improved upon. I consider this book to also be “golden.” Here, not for a new idea it introduced to me (unlike your [Ruddiman’s] book.) But for how it helped me better understand an existing idea that is an evolving part nearer the core of modern climate science. To #1: It doesn’t change the present climate or future projections. But it tells us that human effects on CO2 started from a baseline considerably lower than thought (245-250 ppm versus 280-285 ppm) and the pre-industrial effect on global temperature could have been as large as that since 1850 (Ruddiman et al. 2014; The Anthropocene Review 1-7). The large effect for a relatively small pre-industrial CO2 increase is due to the climate system having had time to come to full equilibration with the CO2 forcing and also to the absence of opposing sulfate aerosol cooling. To #2: I agree with everything Victor said, and will add this. Hunter-gatherers were relatively small in number and moved around constantly, so the landscape had ample time to heal after their disturbances. But — primitive agriculturists were greater in number, lived more stable lives, kept areas more frequently open for crops, and thereby altered atmospheric CO2. To #3: There have been some initial attempts to estimate carbon storage/releases, but nothing definitive yet that I know of. Check out publications on permafrost (Zimov et al., 2009, GRL 3: L02502), and river floodplains (Hoffman, et al., 2013, Earth Surface Dynamics 1: 1-20). One important area of research is extensive mapping of forest losses using pollen in regions other than Europe. To 4: My Wisconsin colleagues and I (Kutzbach et al., 2011; The Holocene) have model simulation evidence that direct carbon emissions from deforestation warmed the ocean. But it’s beyond my expertise to project possible effects on AMOC circulation. Sun is closest to earth during the summer only if you are in the Southern Hemisphere. For the Northern Hemisphere, the smallest earth/sun distance is in winter – early January. I was fairly skeptical of early anthropocene hypothesis a number of years ago but have since become much more receptive to the approach. It seems there could also be a feedback mechanism, particularly in the upper Northern latitudes, with large scale volcanic activity. A few unusually cold years result in failed crops, famine, lost of seed, population decrease, and eventually farming decrease with farm lands becoming reforested. Extended periods of light volcanic activity would provide for good crops, population growth, and more farming with more land clearing. I haven’t seen a lot on the impact of Meso-American and South American agriculture. I have seen suggestions that the large population decrease post Western contact may have had an impact on the LIA but nothing on whether the rise of Meso-American civilizations in particular with heavy emphasis on corn cultivation may have contributed to the MWP. Also, I have wondered how much of the 19th rise in CO2 and CH4 might not be a rebound from the LIA (a favorite skeptic argument) but is instead the rebound of population in North and South America plus population growth in China and Asia with the implication of more intensive farming. As an anthropologist and archaeologist I would point out that the 1960s era distinctions between modes of production are not accurate descriptors of human behavior. Use of fire as part of a suite of behaviors to generate human habitat is a better concept. Stephen Pyne’s work including Fire, a Brief History, is illuminating in this area. H.J. Lutz in the 1950s outlined the origins of fires in the boreal forest. It is likely that fire practices were part of a system designed to maintain certain habitats favorable to humans or to species important to humans which constitutes a kind of husbandry if not purposeful farming. Thanks for that. Indigenous cultures in the Pacific Northwest of North America, for example, were long regarded as non-agricultural. Their diverse practices, including but not limited to fire, for managing their food and other biological resources may be more correctly seen (e.g. Deur and Turner 2005) as ‘pre-agricutural’, acknowledging multiple intermediate modes between passive foraging and intensive agriculture. Not disagreeing but more pertinent to discussion here is the spread of agriculture through Europe, Middle East, and Asian 6000 yrs BP and perhaps rise of agriculture (primarily corn) in North America and Meso-America from 500-1500 AD. These changes were accompanied by semi-permanent or long term conversion of forest to agriculture and relatively higher population densities. Hunters and gathers and various slash and burn agriculturists would not have same impact because whatever transformations done to landscape were more temporary and usually involved periodic reversion of cleared land to original state. What about the relative sharp decrease in CO2 around 1600? The CO2 concentration went down by more than 5 ppm at the end of the 16th century. Could it be due to regrow of forest in the Americas after the population collapse? I guess it would need 2 to 3 Millions km² of ‘new’ forest, to explain the difference, but I doubt about the timing and speed. Are there data (pollen or other) on the forest area of the Americas from about 1400 to 1700, which could give some light on this? Are there other explanations for this drop? Change in ocean circulation and CO2 exchange with the atmosphere? I heart of volcanic activity, but I’m not convinced. There is a small drop (compared to the expected increase due fossil fuels) in the 1990ies may be due Pinatubo but alternatively due reforestation in east Europe and Soviet Union. And there is no large drop after Tambora, so direct volcanic influence may be small. Are there other data f.e. isotopic that can give some hint on possible explanations? Geologists look for a “Golden Spike” that will still be recognisable in millions or hundreds of millions of years time. The start of the Holocene will just look like the start of another interglacial. If it was being named now, using the criteria which have been refined over the last 50 years, it would probably not have been given such an elevated status. This interglacial will look unusually long, because we’ve perturbed the system enough to cancel the next glaciation. If we haven’t quite, yet, we soon will have. However, in hundreds of millions of years time observers won’t have a good enough handle on our Milankovitch cycles to say it wasn’t just a special convergence of cycles. The most long-lived impact of anthropogenic GHG emissions will be a change in stable-isotope ratios, for example 12C/13C, in deep-sea sediments. We can detect past perturbations tens and hundreds of millions of years after the event, with a lot more precision than we can track temperature changes. Such boundaries are usually picked at some threshold above background, or when the rise is particularly fast. That would point to something much more modern as the start of the Anthropocene (50% in 100 years trumps 50% in 10,000 years). Stable isotopes from man-made fission or fusion (fallout) may also be detectable, and perhaps the stable decay products of some radioactive fallout. And the mass extinction of course, but again they tend to be “before” vs. “after”, with a gap, because of the low chance of fossilisation. I don’t rate plastics and cities much, because land sediments are subject to too much erosion and recycling over geological time. You may detect “before” and “after”, but it will be a very blunt spike. Plastic microbeads in deep-sea sediments perhaps, if enough of them sink and they genuinely are non-biodegradable. I would pick 1950, as it is already used as “Present” in a number of fields such as radiocarbon dating and palaeoclimate. Arguing between 1950, 1900 or 1850 is angels-on-a-pinhead territory IMO, from a geological perspective. For a perspective from a couple of years ago, see here. Thanks to #6 Jon I got Ruddiman’s Earth Transformed and he has several chapters about the LIA. The short answer, I think, is the drop is too big to be accounted for by natural processes. The LIA, however, needs to be looked at as part of the broader trend of cooling after the MWP caused by a reduction in solar insolation. Volcanic activity, mass deaths from the plague in Europe and among native Americans from European contact temporarily offset some of the compensating warming effects of human agricultural activity. There is a chilling graph in the epilogue of his book that shows we were just on the threshold of glaciation in the LIA. Population rebound with increased agricultural activity along with the arrival of the industrial age has since moved us well above any risk of glaciation. This paper (non-paywalled ms.) concludes that the low CO2 was caused by increased terrestrial carbon storage, due to a decrease in gross primary production and a larger decrease in ecosystem respiration. IOW a land-vegetation positive feedback (in the sense of reinforcing warming or cooling caused by other factors). They use carbonyl sulfide (COS) as a tracer because it is taken up with CO2 during photosynthesis, but hydrolysed in the plant so not re-emitted during respiration. In summary, the contemporaneous CO2 decrease and COS increase can be explained by the reduced temperature during the LIA, causing GPP, NPP and Rh to decrease, with the respiration reduction dominating due to its higher temperature dependence. A decline in farming activity during the LIA would have increased global GPP due to vegetation re-growth, thus decreasing atmospheric COS, and meaning that pandemic-induced abandonment of farms was not the main cause of the atmospheric CO2 decrease. It is likely that the LIA CO2 net flux was mostly driven by the high-latitude Northern Hemisphere terrestrial response to temperature because: the Northern Hemisphere contains most of the world’s terrestrial biosphere; and the LIA temperature reconstructions showing the best correlation with the CO2 decrease are from the high-northern latitude regions and, specifically, the Arctic. #9. Thanks to James Cross for your supportive thoughts about my hypothesis. #13, 15: I have argued against placing the start of the “Anthropocene” at 1950 (Ruddiman, Progress in Physical Geography, 2018, 42: 451-461; Ruddiman et al., 2015; Science 348: 38-39), Most forest clearance and flooding of rice paddies occurred millennia before 1950 (see Fig. 2 in my post above and evidence in the Ruddiman et al 2016 reference listed there). Also, most industrial-era plowing of prairies and steppes that began near 1830 had ended before 1950. These were by far the largest changes to Earth’s surface by humans to date. As such, how can they POSSIBLY be viewed as ‘pre-Anthropocene’? The Anthropocene Working Group (AWG) rejects them because they developed and spread asynchronously, and asyncroneity violates the dictates of the method they have chosen from the field of geochronostratigraphy. But why should definitional formalisms outweigh and effectively ignore the massive amount of ground-truth evidence showing these prevalent early human alterations? The term ‘anthropocene’ is now in wide use and is clearly here to stay, but preferably not within such a formally imposed straight-jacket. Instead, it should be used informally (with a small “a) to avoid rigid and unrealistic boundaries. #14, 16, 17: Uli (#14) asks about the cause of the sharp CO2 decrease near 1600 and a possible link to regrowing forests after European diseases killed 85-90% of roughly 60 million people. As Dave_Geologist notes (#16), I have argued for an anthropogenic explanation, based on two lines of evidence. First, a land-use model simulation by Kaplan et al (2011; The Holocene) estimated that 37 billion tons (Gt) of carbon were removed from the climate system and sequestered in regrowing forests at that time. Half the carbon would have come from the ocean and vegetation in other areas, and half from the atmosphere. Removing 18.5 billion tons from the atmosphere would cause a 9-ppm CO2 drop (using the 2.12 GtC/1 ppm ratio in atmosphere). This value fits between the brief 10-ppm drop at Law Dome and the sustained 7-ppm value. Second, scientists have estimated a global cooling of 0.15K between the early 1500’s and early 1600’s. Because this cooling integrated natural forcings (solar, volcanic, etc), it can be used to test the possible effect of natural factors by using carbon/climate models that incorporate the many factors that control carbon and climate. Those models indicate a CO2 change of 8 ppm per 1K change in global temperature. So a 0.15K natural cooling should have caused a natural CO2 drop of 1.2 ppm. But this would explain just 12-17% of the observed drop of 7-10 ppm, leaving most of the decrease to be explained by carbon sequestration in the reforesting Americas. Maybe Black Death contributed to initiating the Little Ice Age? Considering that a statistically significant fraction of humanity died as a result of this pandemic. #18 Thanks for joining the discussion and replying William. As a geologist, of course, I’m biased towards geological methods, and things which are synchronous and can be detected a billion years hence. The same goes for the geological members of the AWG. The community has spent a long time working out how to get a globally acceptable “Golden Spike”, with a lot of rancour along the way as peoples’ and nations’ long-favoured candidates fell by the wayside. Breaking the rules for the Anthropocene would tie things up in knots and invite accusations of (political) bias. If it’s a genuine geological interval, it should have a genuine geological starting point, one that is objective and steers very carefully away from “blaming humans” while recognising that humans are the cause. In the case of your area of study, an unwitting cause, unlike today’s humans. In a perfect world that would forestall all “sceptical” critics, but of course it’s not a perfect world and they’ll complain anyway, no matter how dispassionately we approach it. Obviously you could make the call on non-geological/stratigraphic grounds, but then it becomes unfortunate that it was given a stratigraphic-style name. Stratigraphers will naturally feel they “own” it, whoever first invented it. And in terms of “who is to blame for the adverse consequences”, “everyone born after 1950” is more telling than “some Neolithic farmer cutting down trees”. Here’s an off-the-wall suggestion. The Holocene has probably been promoted above its true status in the stratigraphic hierarchy, but at least that means there’s room to subdivide it. Could we come up with a name other than “early Anthropocene” for the last few thousand years? I’m pretty sure the AWG would reject that wording because the late 20th Century will be the standout point in the geological record, but how about Anthropogene? That’s sometimes used as a synonym for the Holocene, but probably doesn’t have a formal definition yet. And the “gene” part points to cause/responsibility. On the 1600s William, I was aware of your and others’ previous work so thought I’d throw Rubino et al. in as an alternative. Do you have a view on whether the increase in COS is as conclusive as Rubino et al. claim? It’s obviously not straightforward to model because you need to explain a decoupling of atmospheric COS from CO2. I don’t know how well their respiration factor is tied down, and of course they had to assume no change in marine primary production. Could there be other factors they’ve missed? I’m not a biologist but would speculate about differences between C3 and C4 plants, and between annually cropped farmland and forests which renew on a centennial scale. Perhaps something about burning too (did they burn stubble back then and was it a significant fraction of the crop mass)? I carefully avoided mentioning anything about climate sensitivity in my comment because it struck me that if they’re right, and if they have tied down the source region to high northern latitudes, they could have fortuitously detected a tipping point rather than something which applies over a broader temperature range. Presumably whatever they think was happening, it was happening to Tundra and Boreal Forest. I can imagine one-off transitions like millions of sq km going from seasonally frozen to permanently frozen or unfrozen to seasonally frozen, rivers freezing or being diverted, snowfall patterns changing drastically, etc.